Mazda MX-5 Convertible Performance, Engine, Ride, Handling | What Car? Don’t be fooled by the modest power outputs of the MX-5’s two four-cylinder engines. This is a light car and doesn't need masses of power to move at a decent pace. However, the 1.5 is brisk rather than genuinely fast and needs to be revved to its high 7000rpm limiter to get the best from it. The 2.0 engine, meanwhile, offers better mid-range punch as well as a significantly more enthusiastic top end. In fact, you often find yourself waiting until the heady 7500rpm red line before changing up a gear, such is the engine’s appetite for revs. Even with a power boost to 181bhp, it's still only small-hot-hatch fast (think Fiesta ST), but that's more than enough to have fun. All the pedal weights are perfectly judged and smooth, precise brake modulation is easy; this is just another reason why the MX-5 is so much fun to drive. Both engines come with a six-speed manual gearbox that snick quickly between ratios, helping you extract the very last ounce of performance. 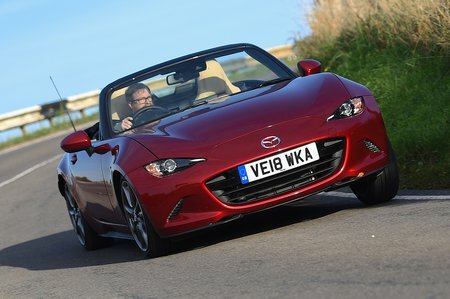 The MX-5 RF offers an automatic gearbox as well, which is surprisingly smooth and responsive. But, naturally, does take away a lot of the driving fun. The MX-5 is softly sprung and proves comfortable over most road surfaces. It’ll cope easily with speed bumps and is'nt overly unsettled by awkward cambers. It even manages to take the sting out of sharp-edged bumps when the larger 17in alloy wheels are fitted. The 2.0 Sport Nav+ and GT Sport Nav+ models get sports suspension with Bilstein dampers for a more focused handling set-up, and are firmer but not uncomfortably so. You'll notice rough surfaces and expansion joints more, though, and we reckon most will prefer the standard set-up that the SE-L Nav+ comes with. This is the rear-wheel-drive MX-5’s trump card. It’s nimble and quick to change direction, with an accurate and generally light-footed feel. The steering is accurate gives you the confidence to sweep the nose from one corner to the next with enthusiasm. 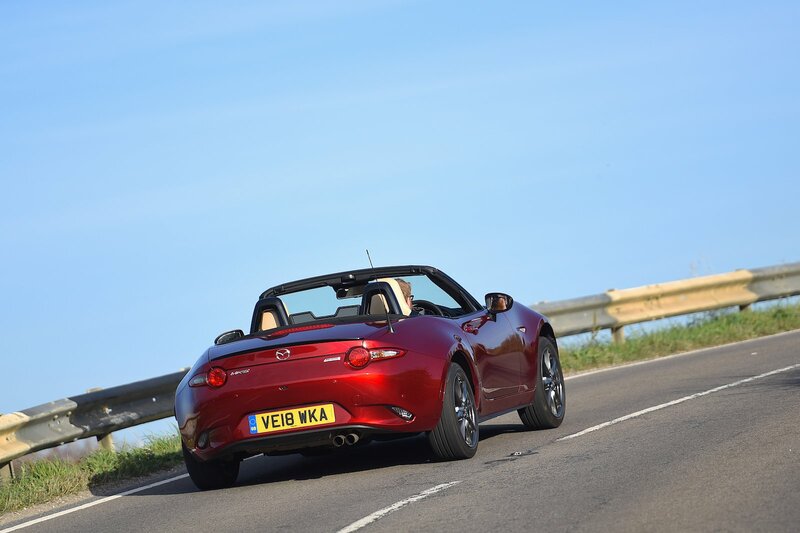 It's further helped by strong levels of grip so you're not afraid to use all of the MX-5's performance on the road. Compared with most of the front-wheel-drive hot hatches you'll pay a similar amount for, the MX-5 is a much more involving, playful car. It's worth mentioning that the soft suspension can result in quite pronounced body lean through corners, but it’s not something that’ll bother most people, as ultimately, there's not much body to be leaning anyway. It’s a small price to pay for such agility, because it helps the MX-5 to ride so smoothly. All MX-5s with the higher-powered engine gain larger 17in wheels and a limited-slip differential for greater traction out of corners. Sport Nav+ and GT Sport Nav+ 2.0-litre models also have stiffer suspension that keeps roll under tighter control and makes the MX-5 feel keener to turn in to corners. You also get a strut brace to stiffen the body shell to further improve handling. Noise levels with the roof up are acceptable for a roadster, but you do have to accept a fair bit of wind and tyre noise at motorway speeds. The good thing is that it’s not too blustery with the roof down, even at higher speeds, so you won’t be afraid to go without the roof even if it's chilly outside. 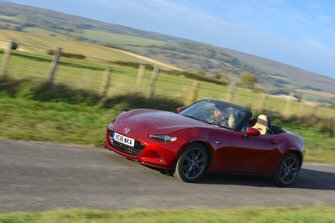 The metal roof of the MX-5 RF is naturally more insulated than the soft-top, but wind noise is still pronounced at motorway speeds and there's an intrusive whistle around the fastback body shape with the roof down. Both engines deliver a pleasing rasp at medium revs and remain smooth until you hit the limiter, so it's a hoot to rev them out. The manual gearbox has a precise, short shift that makes changing gear another joyful facet of MX-5 ownership. You feel some vibrations through the pedals and steering wheel when the engines are at very low or very high revs, and when passing over coarse surfaces, but it’s a background issue rather than a constant pain.